This week my album pick is "Horehound" by The Dead Weather. This is one of those album that I think will be worn out faster than some of my others. Another great project from the obscure musical genius, Jack White. Although he doesn't lay his vocals down as much here, he covers the drums and frankly, he can do any instrument. He pulls back and allows Alison Mosshart to shine vocally, and does she do a damn good job at it. He also jams lead vocals and guitar occasionally. Dean Fertita has amazing synths and tasty licks. This entire album is a terrific mixture of rock and roll and blues, and if you have a pulse, will get you moving around, banging your head and/or tapping your feet and playing the drums on your knees and strumming your air guitar. While you're at it, if you wanna check out more from these guys, "Sea of Cowards" has been out for a while. That one is good as well. Basically in my opinion, at least right now, Jack White can do no wrong. Anything he puts out there, no matter how odd, abstract, or out of this world it is, it always comes out gold. 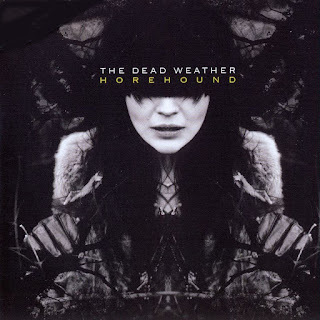 Anyways check it out sometime this week: "Horehound" by The Dead Weather.